With the recent boom in the healthcare industry, nurses are now in high demand! According to the Bureau of Labor Statistics, the nursing profession is estimated to grow by as much as 26% over the next few years. In large part, this growth is attributed to our aging population, new technological advancements, and an increased focus on preventative care. However, hospitals and doctor’s offices aren’t going to be the only hiring grounds. Many elderly patients are opting for registered nurses to provide in-home care. Regardless of your employer, as a registered nurse of any kind it is of the upmost importance to protect your career with professional liability insurance. If working for a facility, it is unlikely their insurance will cover you should an accident arise. It has also been known to happen that if a hospital loses a lawsuit it will in turn sue the nurse to recover damages. Don’t be reliant on an employer, only YOU can protect yourself. If a liability case arises and you’re not covered, not only are you putting your hard-earned career on the line, but you’ll also be responsible for legal fees and any expenses incurred if there is a trial. Obtaining individual coverage will not only protect YOUR best interest, but also enable you to have coverage no matter where you’re practicing, giving you the peace of mind knowing that you’re covered wherever you go. 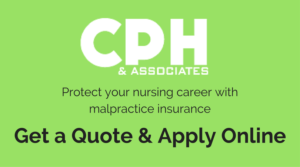 CPH & Associates offers nurse malpractice insurance for registered nurses LPN/LVNs, and nurse aides through cphins.com, and for a variety of other nurse occupations through nurseins.com. When it comes to protecting your assets, it is always better to be safe than sorry! Make the investment in yourself for the best coverage you can afford.